September 14, 2017 – IK Multimedia is proud to announce T-RackS 5, a cutting-edge mixing and mastering system for Mac® and PC, will be available in October 2017 and is now open for pre-order. T-RackS 5 is the most powerful mix and master modular system ever, offering maximum versatility with 4 all-new processors for a total of 38 high-quality modules on a flexible 16 processor series/parallel chain, an unrivaled audio engine, a complete broadcast-ready professional metering section, a new completely redesigned, resizable interface as well as an album assembly section with multi-format export. The Master Match module is a new type of plug-in that automatically matches the sound of a mix with up to 3 other reference tracks using highly sophisticated algorithms. Thanks to this new powerful module, it’s easy to create great sounding masters without the need for any previous audio engineering experience or specialized skills. Based on an iconic American coveted piece of hardware, the new Dyna-Mu vari-mu compressor/limiter is praised for its subtle but instantly recognizable sonic fingerprint. Thanks to its transformers and all-tube modeled heart, it can impart an audible magic which glues all the parts of a mix together. The new EQual digital equalizer is a 10-band, ultra-clear, high-end parametric equalizer with an extremely transparent sound, a full-screen resizable interface for ultra-precise editing and a vast array of filter shapes that replicate the typical curves of legendary British and American analog EQ’s. This “hybrid monster” offers the best of both worlds: digital precision with ultra-detailed editing and on-demand analog character. Conceived as an “all-in-one” solution, the new ONE mastering processor has been designed for easy, streamlined and straightforward audio finalization. It includes an EQ, compressor, analog harmonic exciter, low-end enhancer and limiter that will let anyone achieve professional quality results in a snap. – The standalone suite makes T-RackS 5 a complete, self-contained, one-stop mixing and mastering workstation that allows users to load a set of audio tracks and perform several operations. – The plug-in suite provides nearly all the standalone mode features within the environment of a DAW as the most powerful channel strip or mastering chain available today as a plug-in. 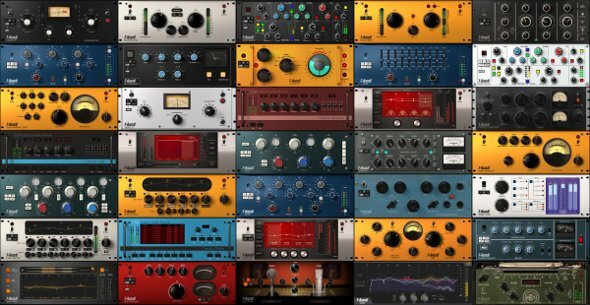 – All T-RackS processors (including metering) can also be used as single plug-ins in any compatible DAW for multi-track mixing and stereo mastering duties. The all-new graphic user interface is designed to control everything from a single window, smoother and faster than ever. Plus, it’s fully resizable, meaning it can utilize up to the full size of a display. The new flexible chain view allows the modules to be dropped into the 16-processor series/parallel signal chain at will directly from the sidebar carousel showing all T-RackS available modules. More sonically powerful than ever, T-RackS 5 now supports audio up to 192kHz / 32 bit floating point, with mastering for high-definition music platforms and distribution without ever leaving its single interface, including 4 dithering options to choose from. The internal resampling engine delivers nothing less than best-in-class performance including DDM (Digital Delivery Mastering) on the output from the final limiting stage, offering an additional layer of protection against inter-sample peaks and overshoots. T-RackS 5 includes a comprehensive suite of metering tools that provide immediate and complete visual information about the audio material content. The new precision loudness LUFS meter is compliant with all leading professional reference standards for music delivery or broadcasting. Peak, RMS and Dynamic Range meters provide useful information about the dynamic response of mixes. The spectrogram, real-time analyzer, phase and correlation meters also help to spot frequency imbalances and phase problems. M/S meters included gather information about the relations between the mono and the stereo content. Additionally, T-RackS 5’s new metering section can be launched as a separate floating window. Now it’s possible to assemble a full-length production directly within the T-RackS 5 interface and create an album sequence with suitable track metadata including pauses, fades, track ID’s, ISRC codes, CD-Text and more, then export single high quality master audio files or the whole project in various formats such as WAV, AIF and standard DDP image for replication or Wav Cue files. T-RackS 5 is expected to ship in October 2017, and will be available in both free and paid versions. T-RackS 5 can be pre-ordered now at special introductory pricing of only $/€99.99 for T-RackS 5, $/€199.99 for T-RackS 5 Deluxe, $/€329.99 for T-RackS 5 MAX and $/€ 199.99 for T-RackS 5 MAX crossgrade (with any registered IK product $/€99.99 and up). About IK Multimedia: IK Multimedia is a computer music technology company that offers a diverse range of affordable and easy-to-use music production tools with great sound quality and a realistic look and feel. With millions of installations worldwide, the IK range has been adopted by musicians of every level, from beginners to professionals, to gain access to high-end, studio-quality gear from their computers or mobile devices. T-RackS™ is a trademark property of IK Multimedia Production. Mac is a trademark of Apple, Inc., registered in the U.S. and other countries. All other trademarks are property of their respective owners. September 7, 2017 – IK Multimedia is proud to announce that iRig® Pro I/O, the cutting-edge high definition audio/MIDI interface for iPhone®, iPad® and Mac®, is now available in the Apple Store® at more than 200 locations worldwide and online. iRig Pro I/O lets musicians connect all their gear to their mobile devices or computers to make music and produce audio, anytime and everywhere, with a portable, pocket-size mobile studio they can always carry with them. The combo microphone and instrument input allows users to record high definition, studio quality audio anywhere. A MIDI input and output allow to connect keyboards and controllers and a headphone output jack with a dedicated volume control is perfect for use with the new iPhone 7 and its future generations. iRig Pro I/O is a truly powerful, professional and portable recording solution that operates on AA batteries when connected to an iOS device, or on USB power when used with a Mac. When used with an optional power supply unit, it even charges a connected iPhone or iPad during extended sessions. A huge selection of IK’s award-winning apps and software is also included with iRig Pro I/O enabling complete music productions with a total value of more than $/€500. Being certified MFi hardware (Made for iPhone and iPad) iRig Pro I/O is guaranteed to be plug-and-play on all iOS devices with a Lightning® port using the included Lightning cable while the USB cable included connects Mac computers. iRig Pro I/O works out of the box with popular Digital Audio Workstation (DAW) software like GarageBand®, Logic Pro® and more. IK Multimedia is the leader of the mobile music creation revolution as the first company to utilize the power of the iPhone, tapping into it with products like the award-winning iRig line of guitar interfaces and AmpliTube amp modeling software allowing users to plug their guitars and basses into their phones and experience the most authentic amplifier tones and effects anywhere. 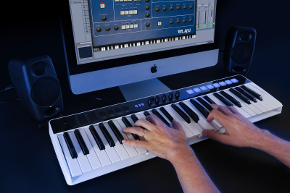 Today IK Multimedia offers more Apple certified music and audio creation and production hardware than any other manufacturer, with the widest range of interfaces, microphones, keyboards and other controllers for musicians, producers and podcasters available on the market. All of this is complemented by a full range of software and apps along with other accessories like stands, speakers and video accessories, focused on plug and play, portability and affordability that has made music and audio creation easier for millions of consumers around the world. With more than 50 million software and app downloads and over 2 million units of its iRig branded products sold since 2010, IK Multimedia is the undisputed leader in the mobile music creation category with over 70% market share. iRig Pro I/O, together with the vast majority of IK Multimedia products are also “Made in Italy” in its fully owned state-of-the-art manufacturing facility that combines the highest quality processes together with a focus on unique Italian world class craftsmanship. This goes together with IK’s social responsibility standards that ensure compliance with the strictest labor regulations in the world along with eco-friendly programs, such as lessening environmental impact by reducing waste, employing smart recycling techniques and reducing power consumption by utilizing roof mounted solar panels to generate electricity. iRig Pro I/O is available now from Apple.com and at more than 200 retail locations worldwide. 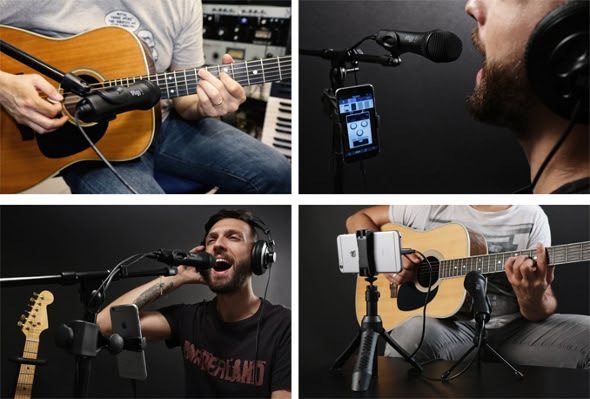 In addition, other IK Multimedia products like iRig HD 2 (guitar interface), iKlip Grip and iKlip Grip Pro (multi-functional iPhone stands) and iRig Keys (keyboard controller) can be found in the Apple Store worldwide. About IK Multimedia: IK Multimedia is a computer music technology company that offers a diverse range of affordable and easy-to-use music production tools with great sound quality and a realistic look and feel. With millions of installations worldwide, the IK range has been adopted by musicians of every level, from beginners to professionals, to gain access to high-end, studio-quality gear from their computers or mobile devices. iRig® and AmpliTube® are trademarks property of IK Multimedia Production. Mac, iPhone, iPad and Lightning are trademarks of Apple, Inc., registered in the U.S. and other countries. All other trademarks are property of their respective owners. 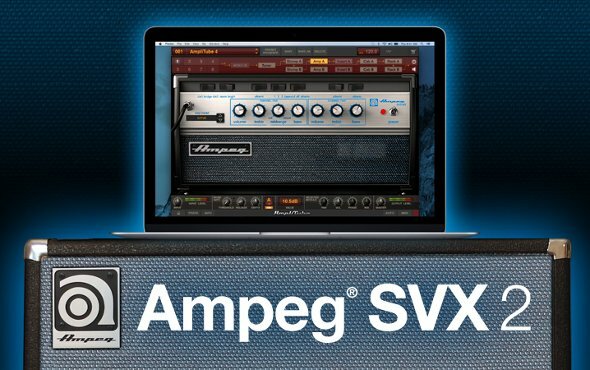 September 5, 2017 – IK Multimedia is pleased to announce the immediate release of Ampeg® SVX 2 for AmpliTube, a new collection that brings some of the most sought-after and iconic bass amplifiers and cabinets from the Ampeg Heritage and Classic series to AmpliTube for Mac® and PC. Ampeg SVX 2 for AmpliTube brings more power to bass players and music producers, giving them the opportunity to expand their collection with 2 amplifiers and 2 cabinets from the Ampeg Classic series: the SVT-VR and V-4B amplifiers along with the SVT-810AV and SVT-212AV cabinets. Also included from the Ampeg Heritage series is the highly sought-after B-15N amp and its matching cabinet, the B-15N 115. Ampeg SVX 2 provides the genuine tone, dynamics and feel of these iconic amps thanks to IK’s industry-leading modeling technologies. Dynamic Interaction Modeling™ not only recreates every individual physical component in the amplifier’s design, but also the nonlinear behavior of each component and its interaction with other components in the circuit. This provides an unprecedented level of realism, touch and feel for each amp. About Ampeg: Ampeg, a LOUD Technologies Inc. brand, has produced some of the music industry’s most innovative and memorable products over the past six decades, satisfying the needs of musicians on stages and in studios all over the world. Ampeg products offer incredibly unique features and performance capabilities, which have resulted in numerous U.S. patents under the Ampeg brand name. For more information visit http://www.ampeg.com. About IK Multimedia: IK Multimedia is a computer music technology company that offers a diverse range of affordable and easy-to-use music production tools with great sound quality and a realistic look and feel. With millions of installations worldwide, the IK range has been adopted by musicians of every level, from beginners to professionals, to gain access to high-end, studio-quality gear from their computers or mobile devices. AmpliTube® and iRig® are trademarked property of IK Multimedia Production. Mac® is a trademark or service trademark of Apple, Inc., registered in the U.S. and other countries. Ampeg® is a trademark of LOUD Technologies, Inc. All other trademarks are the property of their respective owners. August 10, 2017 – IK Multimedia is proud to announce that iRig Mic HD 2, the successor to the highly acclaimed iRig Mic HD, is now available for pre-order. iRig Mic HD 2 is designed to put all the power of high-resolution digital audio into the hands of singers, musicians, interviewers, broadcasters, presenters, podcasters, and vloggers who are looking to capture pristine mobile recordings anywhere with remarkable ease. iRig Mic HD 2 is the only handheld microphone of its kind featuring high-quality 24-bit converters with sample rates up to 96kHz, a low noise preamp, a high-quality gold-sputtered electret condenser capsule for exceptional frequency and transient response and an onboard dedicated headphone output with volume control for direct signal monitoring. 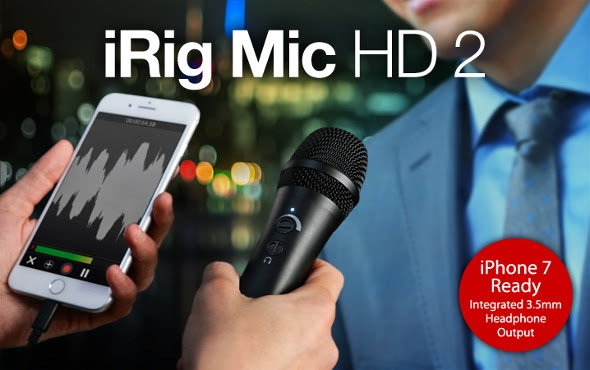 Offering unmatched quality and versatility at an affordable price, iRig Mic HD 2 comes with all the cables and accessories needed in a variety of situations, as well as a convenient table tripod for use during interviews, calls or video conferences. Both in the studio and on the go, iRig Mic HD 2 is much more than just a digital USB microphone; it is a comprehensive tool for boosting the quality of audio content creation with all the convenience of a handheld form factor which cannot be found anywhere else. iRig Mic HD 2 delivers incredible performance and gives users the ability to record their instruments or vocal performances with 24-bit resolution and sample rates up to 96kHz. The integrated low-noise preamp provides an optimal gain range while the gold-sputtered condenser capsule ensures clarity and accuracy over a frequency spectrum of 20 Hz – 20 kHz (-3 dB) making sure all the tiniest details of the sound source are faithfully captured in recordings. Able to withstand a maximum sound pressure of 120dB, iRig Mic HD 2 provides a high level of performance and quality even when recording loud sources while the cardioid pickup pattern will help reject sounds coming from the rear of the microphone. iRig Mic HD 2 features a versatile, integrated headphone output with volume control that can be used for monitoring the audio signal during recording or for listening to high-resolution music – including on the iPhone 7. The output can also come in handy for sending the audio signal to an external device like another recorder, a mixer or a PA system. iRig Mic HD 2 is designed to work flawlessly with the latest generation of iPhone, iPad and iPod touch devices as well as with Mac and PC. It comes with a Lightning connector cable, a USB cable and extra accessories like a convenient table tripod, for use during conferences, radio shows, video calls etc., a sleek carrying pouch, for protecting the microphone while traveling or for storage, a mic stand clip and a handy 5/8″ to 3/8″ thread adapter. iRig Mic HD 2 comes with downloadable versions of Mac and PC software including Ableton® Live Lite™, a Digital Audio Workstation application; T-RackS Classic collection of audio processing plug-ins; and Mic Room, with incredibly realistic virtual models of some of the most desirable microphones of all time. Also included are iOS apps such as the Mic Pack for VocaLive, that adds a collection of virtual microphone models to the real-time vocal effects processing and multitrack recorder app; Pro Bundle for iRig Recorder, which adds indispensable processing like equalization and compression to the pro-audio recording and editing app with video; and Mic Room, the microphone modeling app. iRig Mic HD 2 can be preordered now at just $/€129.99* and will be available for shipping in September 2017. June 29, 2017 – IK Multimedia is proud to announce iRig Pro I/O, the pocket-sized mobile audio/MIDI interface for iPhone®, iPad®, Mac®, PC and Android™ devices is now shipping worldwide. iRig Pro I/O, the successor to IK’s highly popular iRig PRO, raises the bar for personal mobile interfaces, with a new set of features and included software and apps that are unmatched in the category. iRig Pro I/O is an ultra-compact, plug-and-play, truly portable interface that lets musicians hook up all their gear – guitars, basses, studio mics, vocal mics, keyboards and more – to their mobile devices or computers and record 24-bit/96kHz pro-quality audio and MIDI tracks anywhere. iRig Pro I/O features a high quality 1/8″ headphone/line out with level control for use with the latest Apple devices like the iPhone 7 to connect to headphones, mixers or powered monitor speakers in an ultra-compact enclosure that fits in a pocket and can be taken anywhere. Additionally, iRig Pro I/O is the first interface of its kind that includes built-in device charging for extended playing sessions, using an optional power supply. At its core, iRig Pro I/O is a truly professional audio interface, giving players the ability to record 24-bit audio at sample rates of up to 96kHz and rivals traditional desktop interfaces by providing stunning audio quality anywhere. The integrated Class-A preamp features a precision input gain control to handle a wide array of input signals giving it a tremendous amount of flexibility in a super-compact design. iRig Pro I/O features a multi-color LED indicator for visually optimizing the input gain level and monitoring the input signal to prevent clipping. 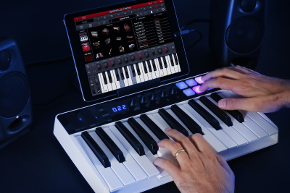 iRig Pro I/O includes MIDI input and output ports offering connectivity with MIDI keyboards, controllers and synths to record MIDI tracks, control virtual instruments, use control surfaces, pedalboards and connect outboard sound modules and more. 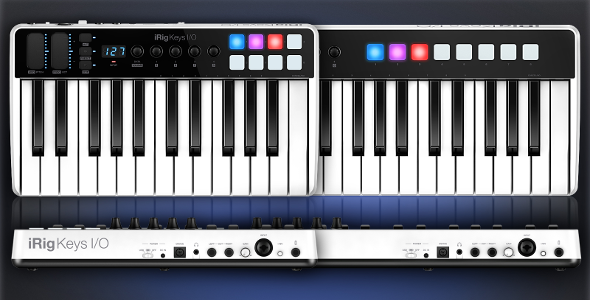 The multi-color LEDs on iRig Pro I/O provide visual feedback of MIDI in/out activity. For real-time monitoring on the go with the latest iPhones, iPads and computers, iRig Pro I/O features a high quality 1/8″ headphone/line output with level control. Users can plug in their headphones, connect to a mixer, or hook up a set of powered monitors like iLoud Micro Monitor. With any connection, the headphone/line output delivers pristine, crystal-clear audio for ultra-accurate representation of the audio program, with a quality far better than the host devices’ built-in audio output. 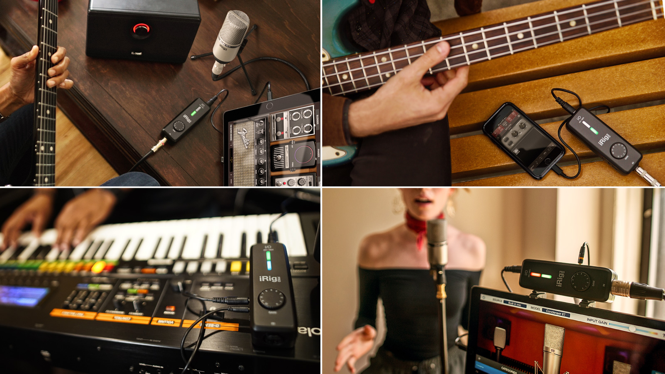 iRig Pro I/O features a Neutrik® XLR/¼” combo input that lets users plug in all their gear – from dynamic, condenser or ribbon microphones to unbalanced Hi-Z or line level instruments like guitars, basses and more. iRig Pro I/O features a 48V phantom power switch for powering condenser or active ribbon microphones. With the adjustable, numeric input gain control, users can easily recall the gain settings for their recordings. iRig Pro I/O can operate on 2 x AA batteries (included) when connected to an iPhone/iPad, or on USB power when used with a Mac or PC. iRig Pro I/O also features a new DC in port that, when used with its dedicated power supply unit, charges a connected iPhone or iPad while in use for unlimited playing or recording time, on stage and in the studio. iRig Pro I/O comes with Mini-DIN to USB and Mini-DIN to Lightning cables along with two 5-pin MIDI to 2.5mm cables for connection to standard MIDI gear. iRig Pro I/O comes with more than $/€500 worth of included IK software. Users get full versions of IK’s award-winning titles like AmpliTube 4, AmpliTube for iPhone and iPad, SampleTank 3 SE and T-RackS Deluxe with Mic Room. iRig Pro I/O is now available from the IK Multimedia online store and from IK authorized dealers worldwide for only $/€149.99*. About IK Multimedia: IK Multimedia is a computer music technology company that offers a diverse range of affordable and easy-to-use music production tools with great sound quality and a realistic look and feel. With millions of installations worldwide, the IK range has been adopted by musicians of every level, from beginners to professionals, to gain access to high-end, studio-quality gear from their computers or mobile devices. iRig® and iLoud® are trademarks property of IK Multimedia Production. Mac, iPhone, iPad and Lightning are trademarks of Apple, Inc., registered in the U.S. and other countries. Android is a trademark of Google Inc., Neutrik is a registered trademark of Neutrik AG. All other trademarks are property of their respective owners. June 8, 2017 – IK Multimedia has just released an important update for Lurssen Mastering Console for Mac®/PC and for iPhone®/iPad® bringing even more processing power for both desktop and mobile users. Lurssen Mastering Console, the award-winning professional mastering software, born from the collaboration of the IK Multimedia development team with multiple Grammy® winning engineers Gavin Lurssen and Reuben Cohen is now even more powerful and flexible making it ideal for multi-track and surround mixing applications. “We’re pleased to offer new features such as improved dynamic range and signal-to-noise ratio along with multi-mono operation for mono, stereo and surround use for the pro users who have asked for it,” said Gavin Lurssen, Chief Mastering Engineer. Mastering Jazz and Classical music is a very delicate process where every tiny adjustment can make or ruin the final master. The Lurssen Mastering Console plugin can be inserted in mono, stereo, multi-channel tracks and busses in any compatible DAW for ultimate flexibility as both a mastering and mixing tool. The new mono operation not only allows users to use the plugin on mono tracks (such as vocals, bass, guitars etc.) in regular mixing sessions, or stereo busses for stem mixing or mastering duties, but it can also be used on 5.1 surround, or even larger surround projects, depending on the DAW. The parameters, presets and styles will remain consistent across all instances on a multichannel bus when the settings are linked. This will allow greater precision and consistency in surround operation for the highest quality results. Mastering Jazz and Classical music is a very delicate process where every tiny adjustment can make or ruin the final master. Thanks to the experience of the Lurssen Mastering team, spanning over 30 years in all kinds of music genres, Gavin Lurssen and Reuben Cohen have developed two new “Styles” for use within these specific contexts. Each Style has been meticulously crafted to reflect Gavin Lurssen’s motto: “You want it sound like you were never there,” meaning the sound will be enhanced and optimized but without altering the original artist’s intent. In order to provide users with an extended control over higher frequencies in any given audio material (whether it is a vocal track or an entire mix,) the De-esser “Threshold” control range has been extended by 3 decibels. This applies to all versions of the product. The new update improves the sound quality even further by retaining all the subtle nuances of the original analog mastering chain while simultaneously removing the intrinsic noise of the hardware machines for a superior, crystal clear sound. The update is available for free to current registered users. Lurssen Mastering Console for Mac/PC is available from the IK Multimedia website and select retailers worldwide for $/€159.99. Users can download and try Lurssen Mastering Console’s full features for free for a period of 10 days. Enables the HD Engine, allowing unrestricted playback, processing and monitoring at 88.2/96kHz sample rates for DSP and export, selectable Digital Delivery Mastering export, selectable dithering and export of uncompressed formats such as WAV & FLAC.